Monday April 14 1884 I was busy about the work all the morning. Henry started away this morning though he did not feel very well. I went to town in the afternoon and got a few things I wanted The boys went down to Uncle Jims to a party given in honor of Jeffs being married. Aunt Em was here for dinner. I had pictures taken today. Tuesday April 15 1884 I did some sewing this forenoon and was in town most of the afternoon I helped the girls sew a little at Hatts. Weather cold and unpleasant. 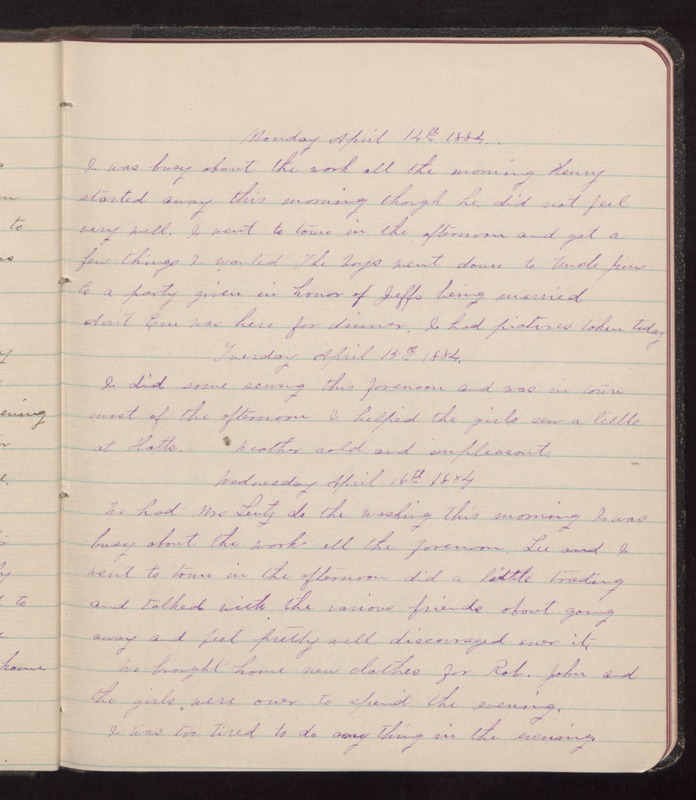 Wednesday April 16 1884 We had Mrs Lentz do the washing this morning I was busy about the work all the forenoon. Lee and I went to town in the afternoon did a little trading and talked with the various friends about going away and feel pretty well discouraged over it. We brought home new clothes for Rob. John and the girls were over to spend the evening. I was too tired to do any thing in the evening.